Born in 1978, Wang is a native of Kaifeng, Henan province. 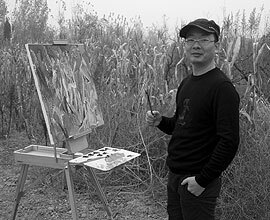 After graduated from the Art College of Hainan University, Wang became a professional artist and specialized in contemporary oil painting. “Wang is a passionate person, meticulous and possesses a strong character. He founded the “108 Painting Club” which persists on striving for the best without compromise had made him and his followers forerunners in exploring new frontiers in expressionism,” said art critics. “Wang’s latest art of work disseminates his pursuit of a free spiritual life and the passion for colors,” added art critics. In 2015, Wang had his first solo exhibition being held in Guangzhou. He is currently residing in Shenzhen.